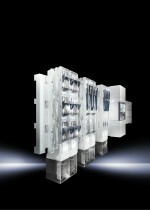 RITTAL reports its range of market-leading power distribution systems for enclosures has just been extended and says its popular 185mm Ri4Power busbar provides trusted, safe and compact power distribution within enclosures. The company says its modular system is easy to install in just three steps, and consists of standardised and tested products, all of which meet the requirements of IEC 61 439 for low-voltage switchgear assemblies with design verification. The newly expanded Ri4Power range now allows both 1600 amp and 630 amp moulded case circuit breakers to be used and connection adaptors and connec-tion blocks are now available to enable faster cable connection. The Ri4Power busbar system can be configured in Rittal Power Engineering software; the relevant program module is included within its latest version (6.3).